Modern Intel Core CPUs (5th and 6th generation) have a Intel Processor Trace (PT) feature to trace branch execution with low overhead. This is useful for performance analysis and debugging. simple-pt is a simple standalone driver and decoder tool to implement PT on Linux. 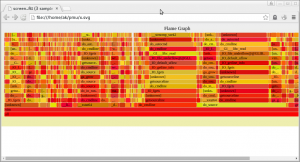 How to generate a FlameGraph with Processor Trace. 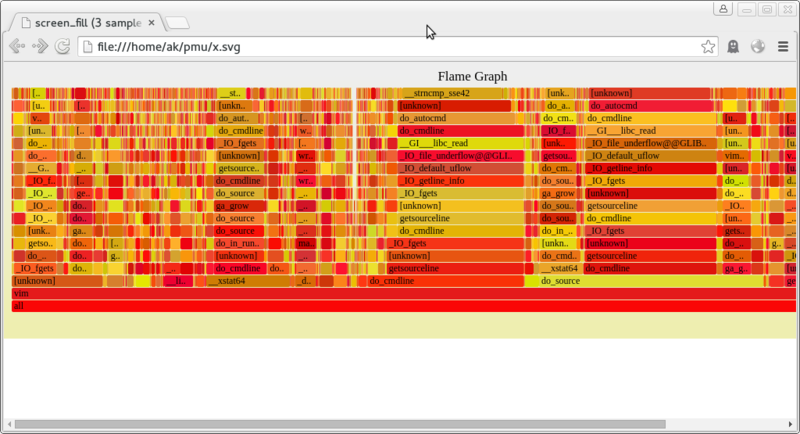 Everybody loves Flame Graphs. Processor trace allows to do as very exact histograms of a program’s run time. Normal sampling has shadow effects, which can hide some details. Processor traces every branch, so it can be much more accurate than normal sampling. You need a Intel Broadwell or Skylake CPU. Running at 4.1 or later Linux kernel where perf supports PT. Collect data from the workload. Best to not collect too long traces as they take much longer to process and may need too much disk space. The i100us means the trace decoder samples an instruction every 100us. This can be made more accurate (down to 1ns), at the cost of longer decoding time. The ‘g’ tells the decoder to add callgraphs. It is possible to click around. Here’s a larger svg example from a gcc build (2.5MB). May need chrome or firefox to view. In principle the trace also has support for more information not in normal sampling, such as determining the exact run time of individual functions from the trace. This is unfortunately not (yet?) supported by the Flame Graph tools.